Warehouses are an integral part of Logistics Handling where a Material are stationed and delivered to various locations through Truck, Containers and Rail Wagon. Hence Lot of Human labour becomes involved in daily (a) Unloading from Trucks / Container. (b) Stacking in Godown for preservation / Storing. (c) Unloading from the Stacks(d) Loading in Trucks, Container and Wagon.Bajaj through its most innovative, commercially feasible designs assists Warehouses job done through their machines which has several advantages like :(a) Earliest Pay Back Period. (b) R e d u c i n g L a b o u r Fatigue. (c) Overall Increasing the efficiency. (d) Modular design and customised features including automation like diverter, check weigher etc and superb performance makes it very fabourite with customers who wants to handle the logistics in the warehouse where after automatic weighing and bagging, bags are lifted, diverted, raised, lowered for either loading in trucks or for stacking in the storage areas. Its unique design for loading and unloading of 10 to 50 kg bags or cartons makes it a favorite in so many industries. Having a minimum feeding height of 300 - 500 mm and a maximum 3- 4.5 Meter height makes it very competent for loading to and unloading from the Trucks / Containers / Lorry. Designed for 500 bags per hour. 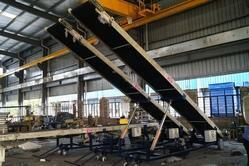 These conveyors can be made as per the requirement of Customer and the available Infrastructure.